Camille from Simplify and Carrie from LaVieEnRosie are hosting a parade of first quilts. I come from a heritage of quilting, both from my family and from my church affiliation. I spent years flitting from one craft to another, which ran the gamut (tole painting, china painting, counted cross stitch, knitting, crocheting, needlepoint...), well, you get the picture. I would be passionate about yet another new venture, and had a husband who never complained once, not about all the new supplies I needed, about all the storage it would probably take up...never once (thanks, Mark--you're the best!). But eventually I would get bored and look for something else. Finally I thought, why not embrace my heritage and learn to quilt? The best decision I ever made. So my good friend, Dotty, drafted out a very simple pattern, double four-patch, and I agonized over the fabric choices. Only four of them, but I spent hours running from one store to another, to make sure they were perfect. I started it in August 1994. She taught me how to hand quilt in a hoop, and I finished it in March 1996. By that time, I was working on several other quilts and had quite a stash started. I have a lot of quilt tops in the works, but by a series of strange events, the last quilt I have actually finished was for my second pattern to be published, called Jammin' Jelly. It's a super easy quilt to make, great for those times when you need something in a hurry. So what have I learned since August 1994? That I have never once become bored with quilting. It continually fascinates me and fulfills my need to be creative. I enjoy nearly every aspect of quilting (with the exception of putting the quilt sandwich together for quilting....), and fabric selection is probably my favorite part. I enjoy taking time with complex quilt piecing, and wish I could learn how to machine quilt my own quilts. Quilting has gotten me through a really sad and trying time in my life. It is tactile and colorful. I have made good friends specifically because of quilting, and that group of friends is growing through blogging, and it doesn't even matter that I probably won't meet many of these new friends in person. There is a community out there that I am part of and quilting continues to enrich my life. We love our Cindy quilts! You're the best! Both quilts are wonderful ~ as is your beautiful glasswork! Thank you for sharing your quilts and your lessons, and I'm glad that quilting and quilters have been there for you during difficult times. Those "ties that bind" are a wonderful benefit of quilting. All reasons I'm learning to quilt! Im so lucky to be a part of your group! I admire all quilt designers...I don't know how you gals do that, but I'm glad you do cuz otherwise I would have given up long ago. I love both of your quilts. They say a lot about you, I am impressed that you hand quilted your first quilt! I was waaay too impatient to even begin to think about that when I began quilting. 15 years of quilting and I am beginning to give it a try! I also enjoy meeting other quilter through blogging, it's nice isn't it? I will be looking for your patterns! I totally agree with you that quilting never gets boring! There are always new fabrics and new patterns that inspire. Your first quilt is very sweet. 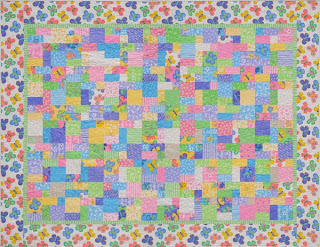 Your quilts are very amazing and it is wonderful to see that you have enjoyed embracing quilting! Thanks for sharing! My sentiments, exactly. We're part of a big family--quilters. Thanks for sharing. Beautiful quilts! I know what you mean about the pleasure of quilting when life is stressful. Beautiful quilts! I'm a new quilter, and I can already see how it is such a relaxing and creative hobby.